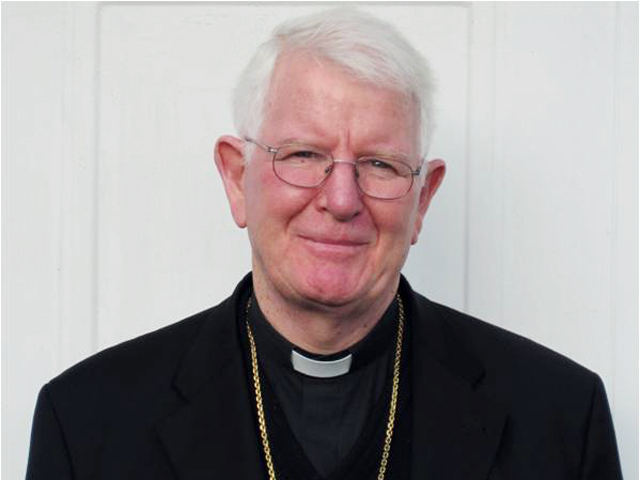 Welcome to this week’s Bishop’s Blog – the last now until September! 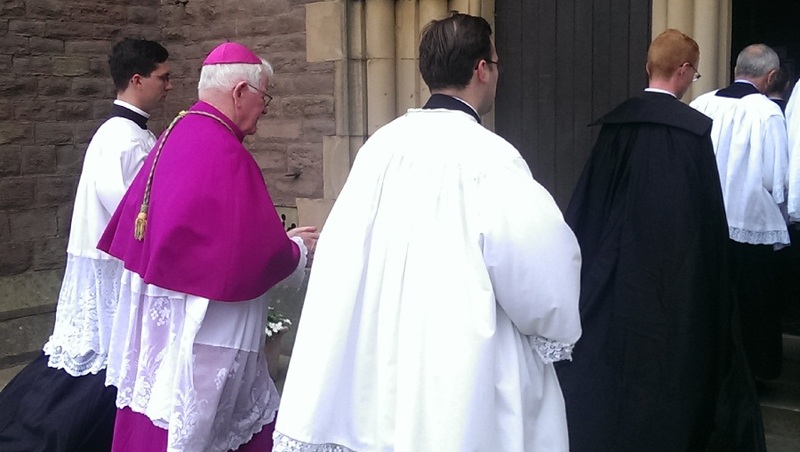 The richness and diversity of our Catholic faith was brought home to me on Sunday when I took part in two quite different liturgies in Preston. 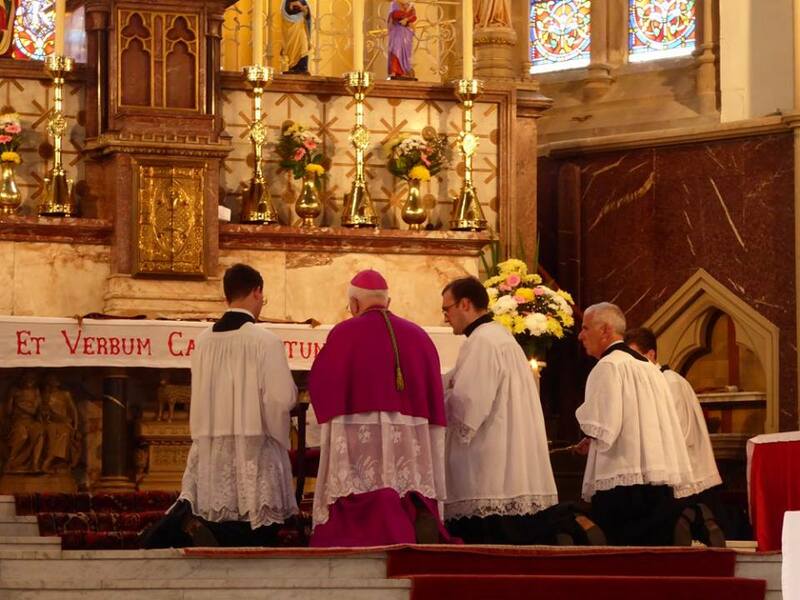 The first was my celebration of Mass in the Extraordinary Form in the splendid St. Walburge’s shrine church (a Grade 1 listed building), now in the care of the Institute of Christ the King, Sovereign Priest. 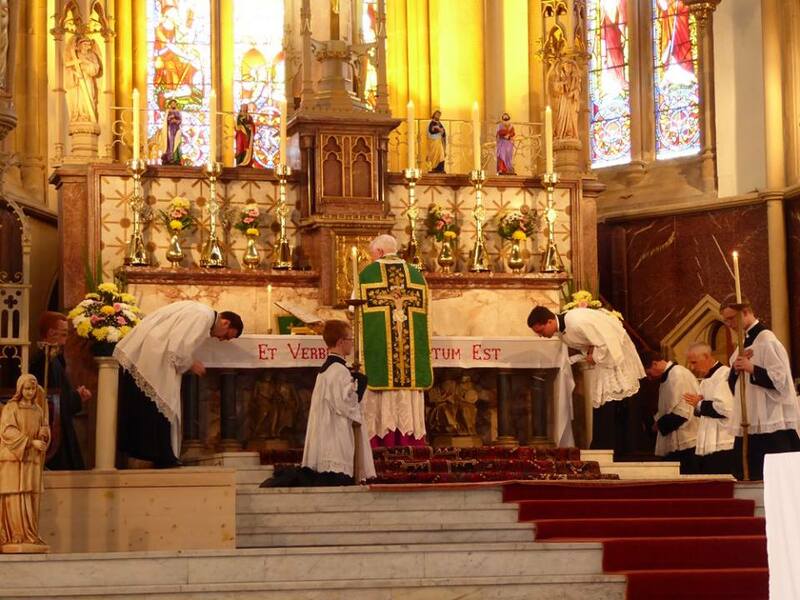 Those of us who belong to an older generation will recall from our childhood days Mass being offered in this way, and which in fairly recent years under Pope Benedict XVI has been again permitted and approved, and caters for Catholics who prefer the worship and liturgy of the ‘Latin Mass’. The strains of Gregorian chant and periods of sustained silence which are a feature of the “Extraordinary Form” hold out an appeal to those who cherish an older tradition as expressed in the Church’s ancient chant, said to go back to Pope Gregory the Great in the fifth century, a plainchant which can be quite haunting as well as being creative of an evocative and reflective atmosphere. 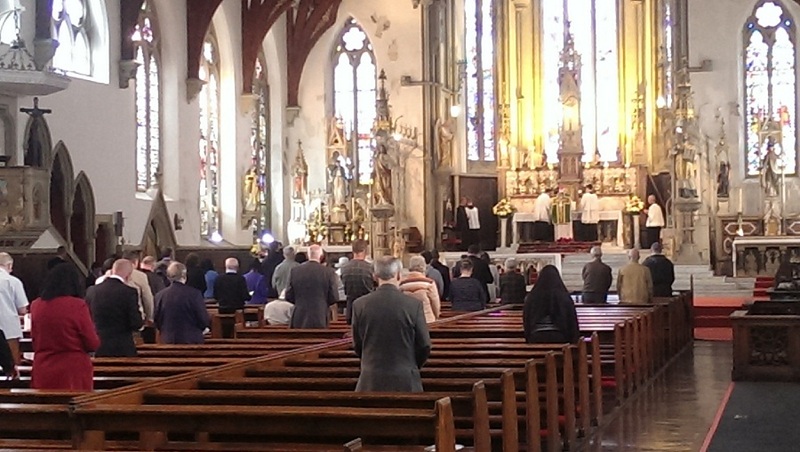 The increasing number of those, especially the young, who attend Mass in the Extraordinary Form is indicative of a wish to be in touch with this rich seam of the Church’s long and honourable tradition of worship, and find that it suits their particular preference to worship God at Sunday Mass. 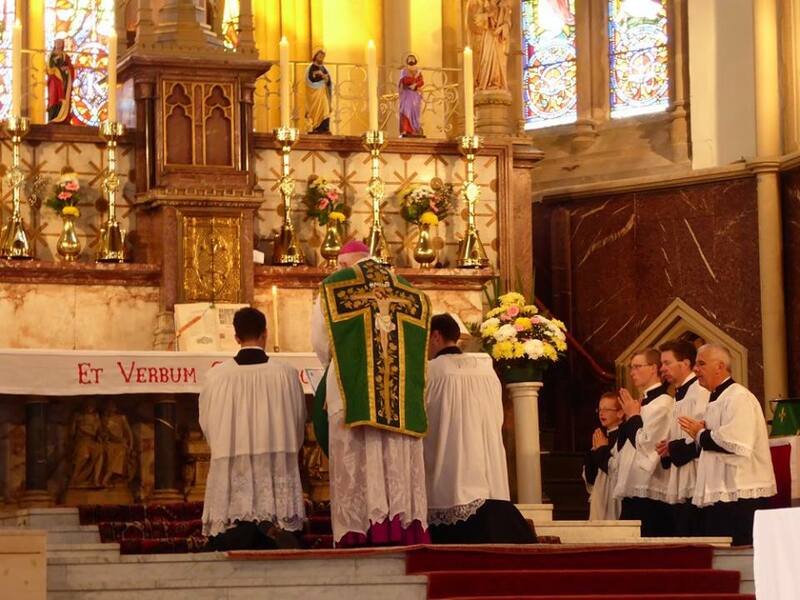 The Institute carry out with care and dedication the traditional liturgy in the quite magnificent surroundings of St. Walburge’s, and it is wonderful to see this building again in daily liturgical use for the worship of God and the benefit of his people. 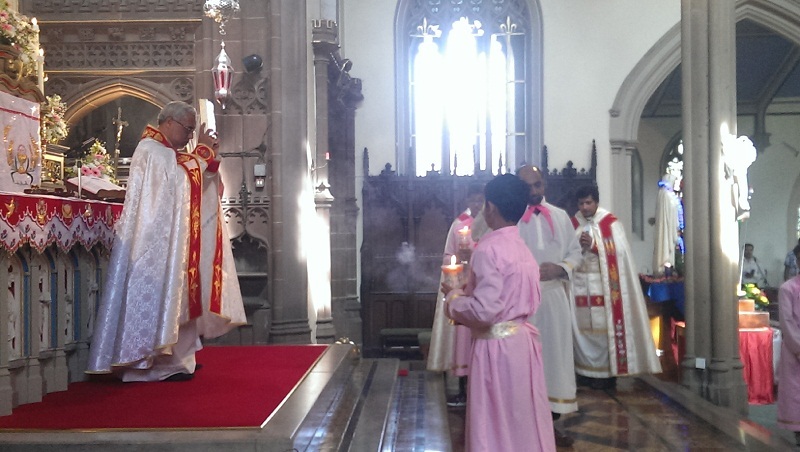 An even older form of the Divine Liturgy is that preserved in the Indian Syro-Malabar Church. This Church proudly traces its origin to St. Thomas the Apostle, who brought the faith to Kerala, South India, just after 50 AD. I attended their Mass in the church of St Igantius. Preston for the new Personal Parish St. Alphonsa on Sunday afternoon as the parishioners celebrated the joint feasts of St. Thomas and St Alphonsa. 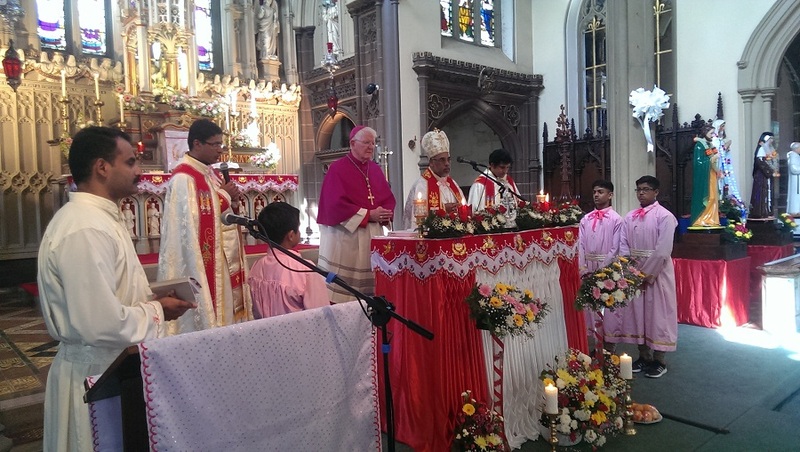 A Keralan Bishop, Bishop Joseph, was the celebrant of the Mass, joined by two priests, and at which I presided. Their liturgy lasts longer than we are accustomed to, yet is marked by congregational participation and an intensity of singing in their Malayalam language, hallowed by long centuries of usage. 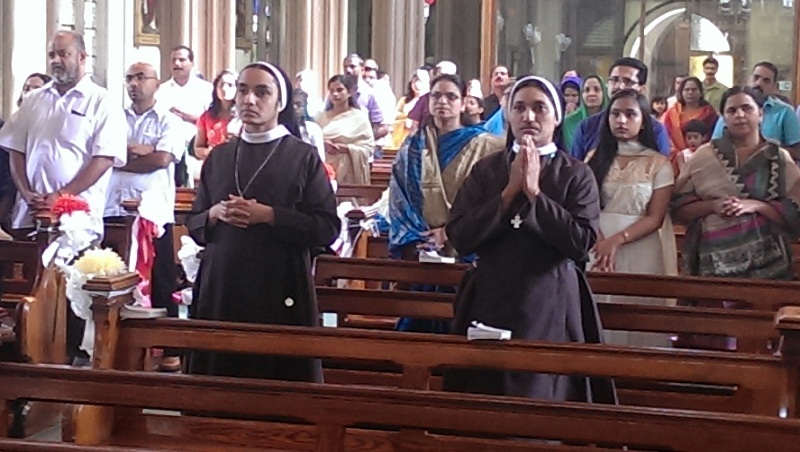 The Syro-Malabar communities in our Diocese are a powerful reminder to us of what the word Catholic means, i.e. having a universal dimension. 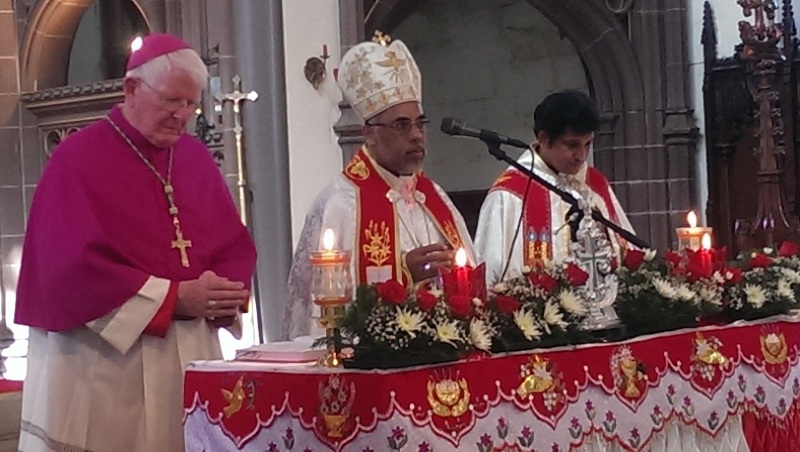 We in the West form part of a much bigger Church, as the presence in our midst of so many of our Syro-Malabar brothers and sisters testifies. Following their liturgy, the community put on a wonderful cultural evening, distinctively Catholic and Indian at one and the same time. To me, it presented a fine example of faith- inculturation. The long Asian tradition of colourful dress, with dignified and expressive dance and movement, conveying a thoroughly Christian message, was a pleasure to see. Reflecting at the end of a long day, I thought of just how rich our Catholic religious culture is. 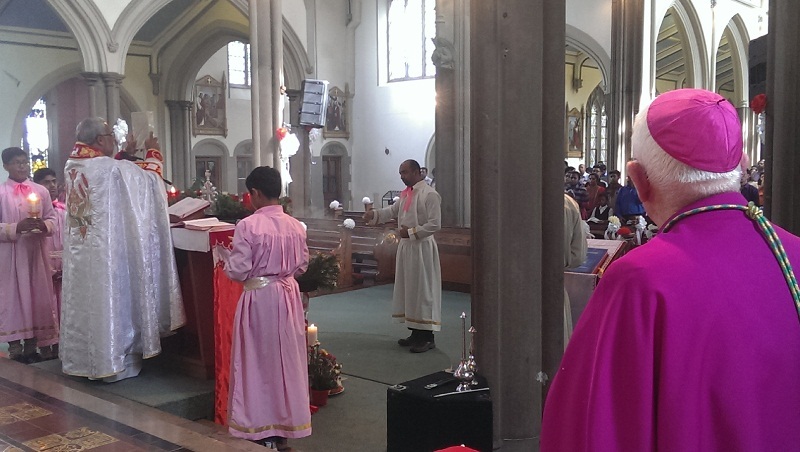 My day began with the time-honoured Latin liturgy whose roots date back more than fifteen hundred years, and which has helped preserve and hand on the doctrines of our faith, and concluded with a profoundly Asian expression of our Catholic faith in the Syro-Malabar liturgy. When we pause to think, we have much to be grateful to the Lord for, and equally as Catholics to be proud of. P.S. The Bishop’s Blog will return in September. Blessed Edward Bamber – Pray for us! 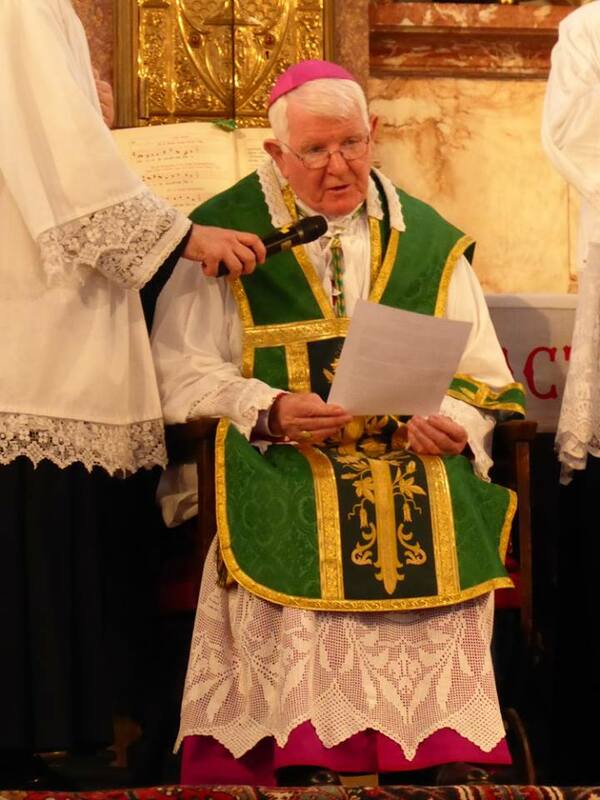 I had the pleasure last Sunday morning of joining one of our senior parish priests, Canon Tom Dakin, as he celebrated Mass two days after his ninetieth birthday and now in the sixty-fifth year of his priesthood. The parishioners of St. Nicholas Owen, Little Thornton, came to be with the Canon and acknowledge gratefully and gladly his long priestly ministry to their families over many years here, and in the neighbouring Sacred Heart parish where he had previously been parish priest. The papal blessing from Pope Francis which I presented towards the end of Mass seemed particularly appropriate as we marked this faithful priest’s long and devoted service, going back as far as 1951. Canon Tom’s brother, Fr. Gerry, himself now a priest for sixty-three years, was also present both for the Mass, and with a good number of parishioners for the meal afterwards. The warm and congenial atmosphere throughout the whole day, I felt, was an expression of the appreciation of Catholics for their priests, and of the realisation that the Lord does minister to his people through the gift of priesthood which he bequeathed to the Church. A later appointment that day was for a Confirmation at Castlerigg Manor, near Keswick, of one of our Volunteers, a young lady from Spain. 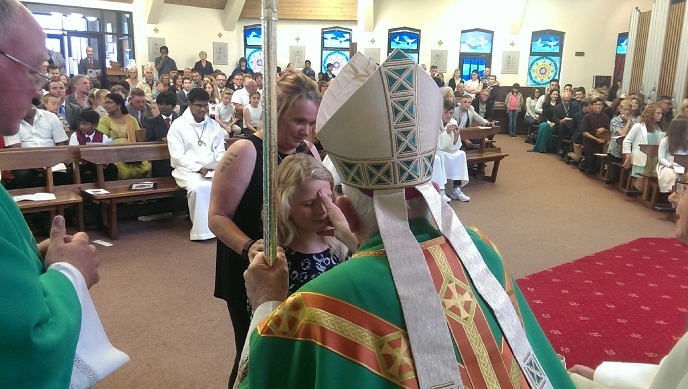 Her colleagues formed the congregation at what was a simple but moving Confirmation Mass. The Holy Spirit chooses his moments, I reflected, and the time was just right for this young person to receive this special sacramental outpouring of grace. The meal with her friends afterwards and the presentation of a bilingual English-Spanish bible will ensure that Sara will long remember her Confirmation day! 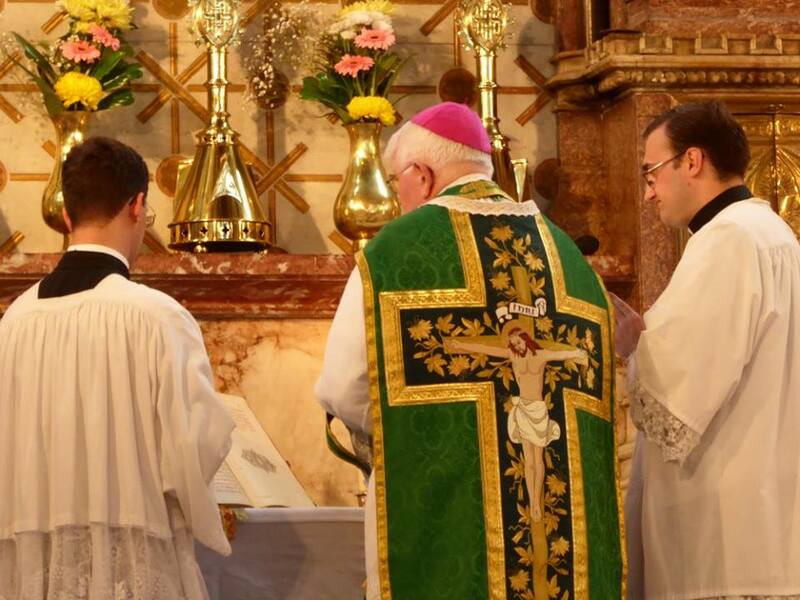 It was back to the Fylde and Bispham, near Blackpool, on Tuesday evening for the annual Mass in honour of the local martyr, Blessed Edward Bamber, (d.1646) who was born close to where our priests’ retirement home now stands, Saint Winefrides. Blessed Edward was imprisoned for his faith in Lancaster Castle and martyred in the city. Well over one hundred people, friends of St. Winefride’s, gathered in the grounds of the house for an open-air Mass with the retired priests and those from the locality. The good weather permitted us all to mingle and share a cup of tea afterwards. How the memory of our Catholic martyrs lives on, to inspire and encourage us well over three hundred years later! It is reassuring, even comforting, to assemble and offer Mass on a peaceful summer’s evening in memory of Blessed Edward. He and his Lancashire martyr companions do live on in our faith memory, and by remembering them we are also acknowledging the great debt we owe them. Meetings apart, my last engagement of the week was to confer Confirmation on Thursday evening in St. Gregory’s parish, Preston (close to Deepdale, and Preston North End FC!). The parish had prepared their young Confirmandi well, and after a Confirmation Mass Catholics always seem to leave the church with a smile, not to mention those just Confirmed. St. Gregory’s was no exception. Would this, I wonder, be an example of St. Paul’s words of “being aglow with the Spirit”? The weather held up last Saturday for our diocesan pilgrimage to Ladyewell Shrine. 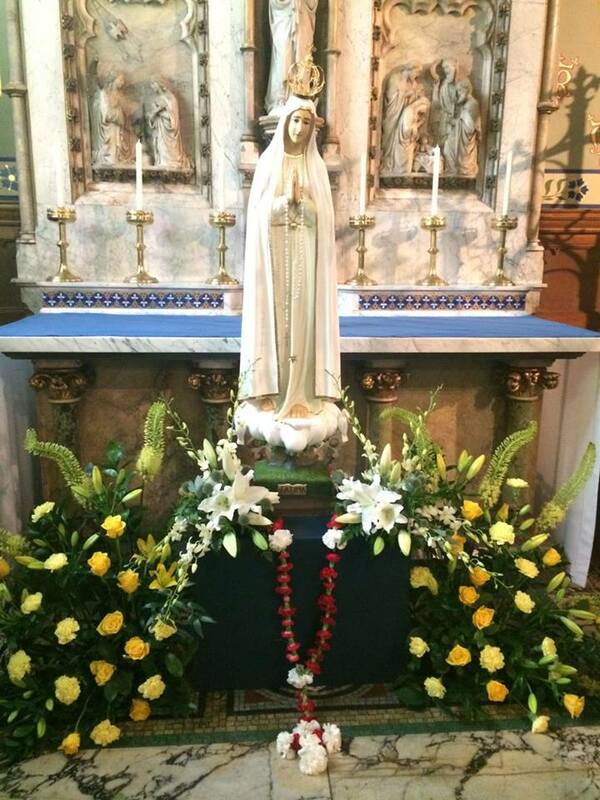 We began with Mass in the nearby parish church, St. Mary’s, Fernyhalgh, before processing along the country lanes with the Blessed Sacrament to the shrine itself, during which the Rosary was recited. On reaching Ladyewell we concluded with the litany of Our Blessed Lady and Benediction. I also blessed a newly crafted statue of the Divine Mercy, set attractively in a specially constructed alcove. The shrine at Ladyewell, though within hearing of the M6 motorway, retains an atmosphere of peace and prayer, and attracts groups and families on a very regular basis, especially during the summer months. Just to sit and reflect for a short time at the shrine really does help a pilgrim to see things in perspective, and of course to be made aware in faith of the presence of Our Blessed Lady. The Fathers caring for the shrine are to be commended for continuing Ladyewell’s wonderful tradition. I was absent from the Diocese this past week in Oxford, attending an editorial committee meeting of the International Committee for English in the Liturgy (ICEL). The ongoing and extensive task of ICEL consists in the translation of liturgical texts from Latin into English, for example the Rites of Ordination to the Liturgy of the Hours, and much else beside. The work of accurate translation is a painstaking one, with the overriding consideration being that of handing on to our Catholic people the faith in all its integrity in the language of the English liturgy. This is a mostly hidden work, but essential for the ongoing life and liturgical worship of the Church. While in Oxford we had the pleasure of a short tour of the places associated with Blessed John Henry Newman, ably led by a well-informed Oratorian Father. Cardinal Newman came to Oxford as a young Anglican in 1816, to Trinity College, in the chapel of which he made his First Holy Communion as an Anglican, and a chapel of which he retained fond memories. He later became a ‘fellow’ of Oriel College and spent a considerable number of years there. We visited the dining hall at Oriel which has probably not changed a great deal since Newman’s time there, and where his portrait now hangs. I was particularly interested and pleased to see also depicted on a stained glass window in the Oriel dining hall the coat of arms of Cardinal William Allen, who had been a student there centuries before. So Lancaster can claim a connection with Newman’s Oriel! The towering figure of Cardinal John Henry Newman, now Blessed, continues to attract and fascinate people of all faiths and none. He has left behind extensive learned writings and copious correspondence which amount to a veritable life-time study. When he left the Anglican Church after a period of considerable personal turmoil, he moved from Oxford to the village of Littlemore close by, and was there received into the Church by the Italian priest, Dominic Barberi. We bishops and priests of the editorial committee had the privilege of seeing the room where Newman made his Confession, and to celebrate Mass afterwards in the little chapel he had originally set up. The house at Littlemore is something of a shrine to the great Cardinal, with many photographs and memorabilia from his long life. Retracing this particular part of Newman’s long life, I found to be a reflective experience and a spiritually satisfying one. Another short outing, though not connected to Newman, was a visit to the beautiful little Catholic church at Dorchester-on-Thames, which sits in an area closely associated with St. Borinus and Anglo Saxon Catholicism. This little church is a true gem and speaks loudly of the Recusant period in England, as well as being a wider link with the Church of many centuries ago. As a group we enjoyed the kind hospitality of the Fathers of the Oxford Oratory of St. Aloysius Gonzaga for our daily celebration of Mass. Newman never lived to see his wish realised of having an Oratory in Oxford, but he would undoubtedly be delighted with the presence there today of the Oratorians whom he originally established in England, and who provide such excellent and admirable pastoral service to the large congregation who attend St. Aloysius’ church. 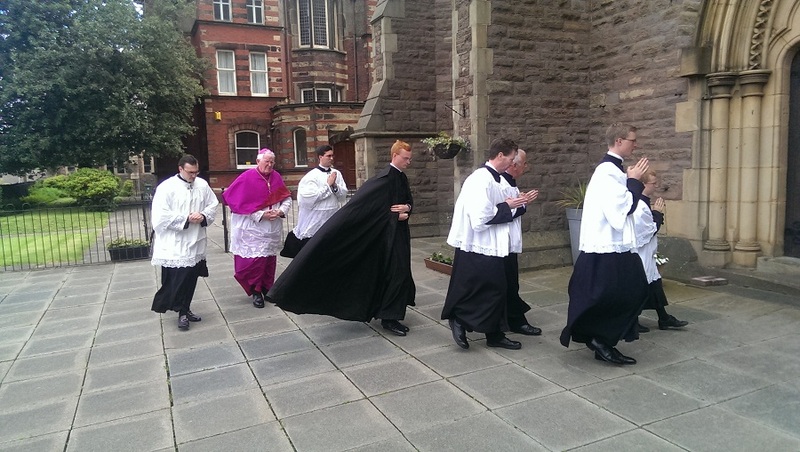 A Full Week – Out and About in the Diocese! 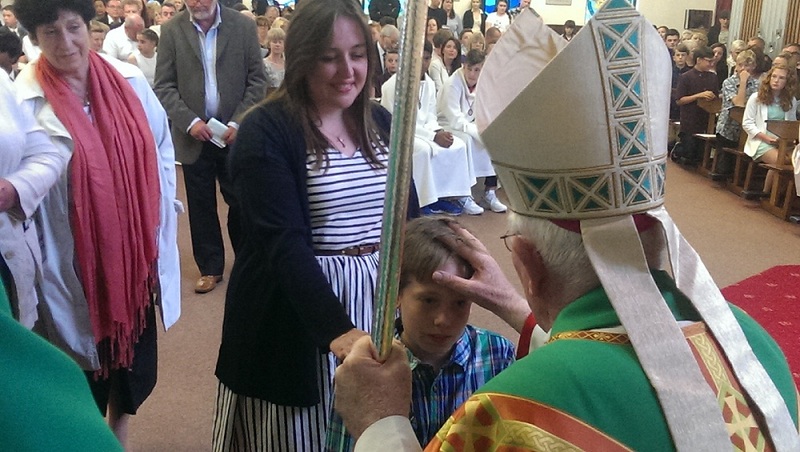 The past week has been a varied one, taken up mostly with Confirmations and pastoral visits. 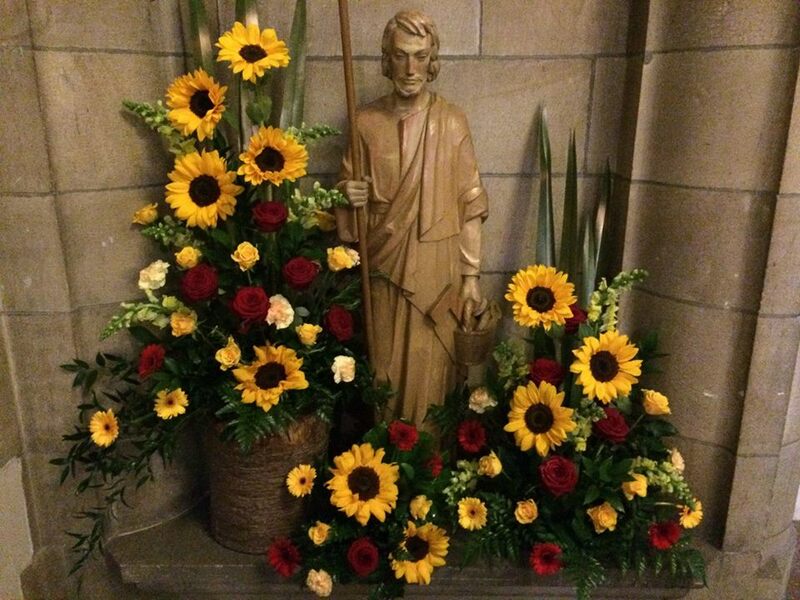 At the weekend St. Peter’s Cathedral, Lancaster was the setting for a really impressive flower display, with skilful and artistic floral arrangements depicting themes of one kind or another. Different groups from the locality made their own contribution, and it was delightful to see such colour and natural beauty arrayed around the cathedral on a dull Saturday afternoon! 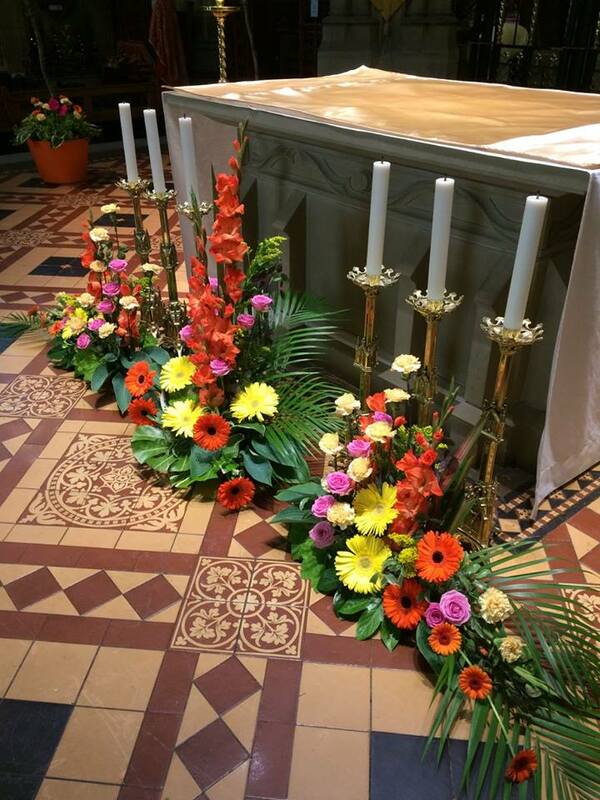 Particularly eye-catching were the floral arrangements, sponsored by Aid to the Church in Need, evoking the persecution of Christians throughout the world. 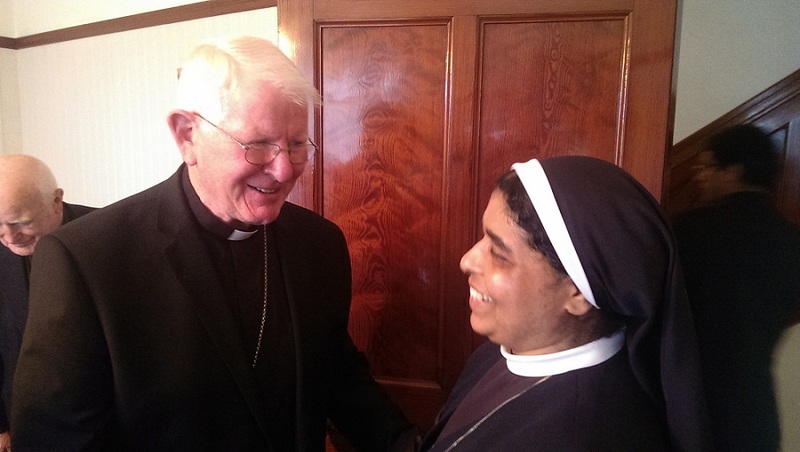 On Sunday I had the pleasure of meeting and having lunch with the Mother General of the Congregation of the Mother of Carmel, (from Kerala, India) Mother Sibi, two of whose Sisters are presently working within the Diocese. The Mother General was on a visit to her overseas communities. 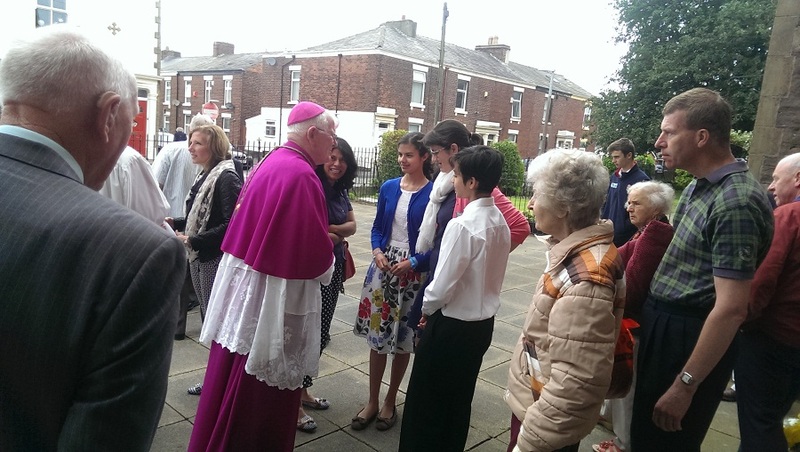 In the same evening I administered Congregation to children and young people in St. Clare’s parish, Preston. 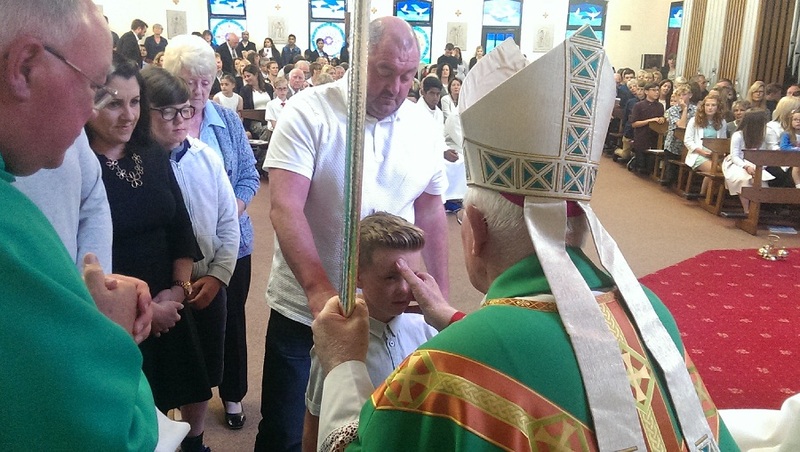 A packed church again underlines the importance placed by parents and families on their young people’s Confirmation, and the awareness that this is moment of great importance for their child. 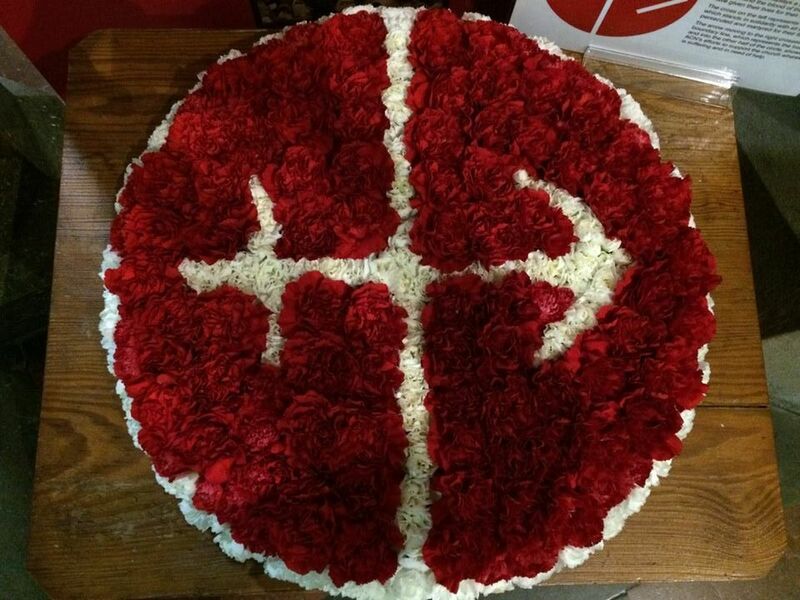 St. Peter’s parish, Lytham, celebrated their patronal feast on Wednesday, with the feast of SS Peter and Paul. I offered Mass and during it Confirmed twelve of their young people. 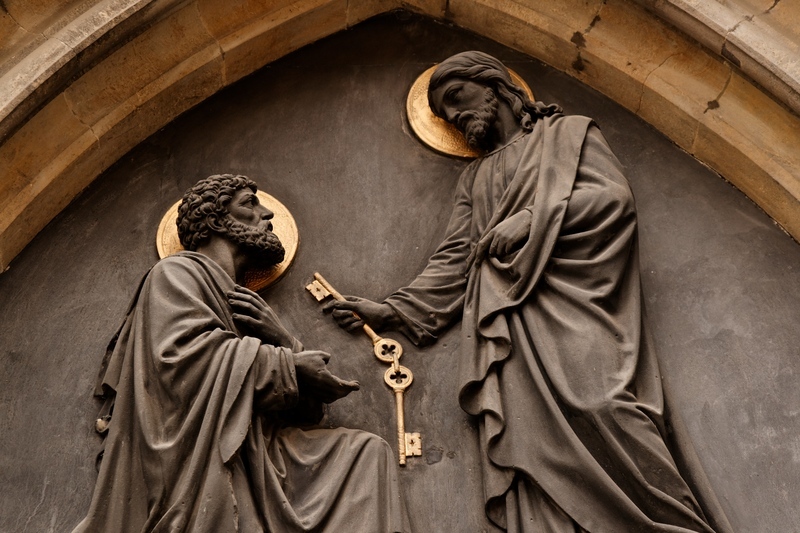 Peter and Paul, I commented, in their generous and ultimately total response to the Holy Spirit were powerful role models for those newly-Confirmed. May these great Apostles inspire and intercede for these and for all our young people. The children of the Cathedral Primary School, with the feast of St. Peter on the previous day, were in celebratory mode this past week, and I joined them on Thursday morning for an assembly. The subject of their assembly, not surprisingly, was St. Peter, and from Reception to Year Six each class depicted an aspect of the Fisherman’s life, especially through their art work. As is so often the case, when children make a presentation they provide us with much interesting and spiritual food for thought, and Thursday’s assembly was no exception. The great Apostle and close friend of the Lord Jesus will surely have been smiling from heaven (with his keys!) looking approvingly on the Cathedral children’s obvious affection for their patron saint. Well done to the staff and pupils of Cathedral School! 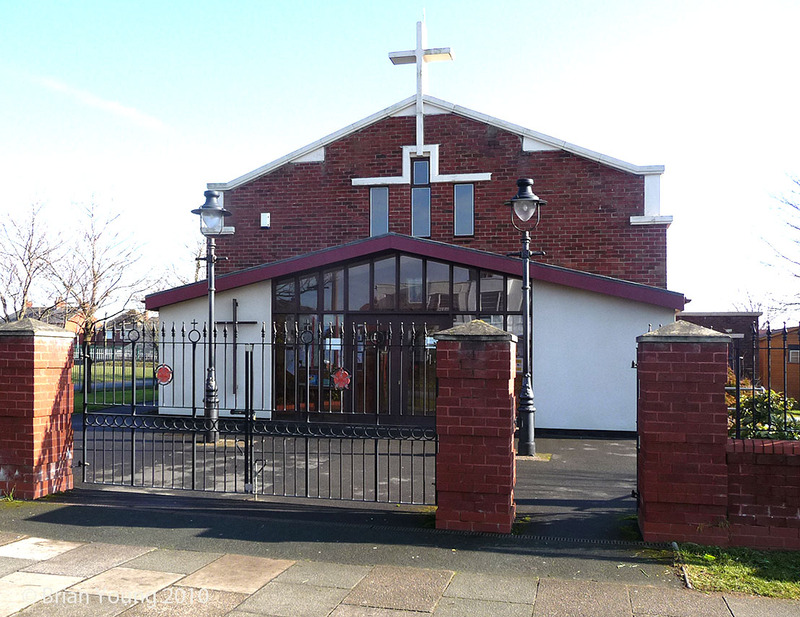 The day finished with a visit for Confirmation to St. Bernadette’s parish, Bispham, where I administered the sacrament to a group of young people and one adult. 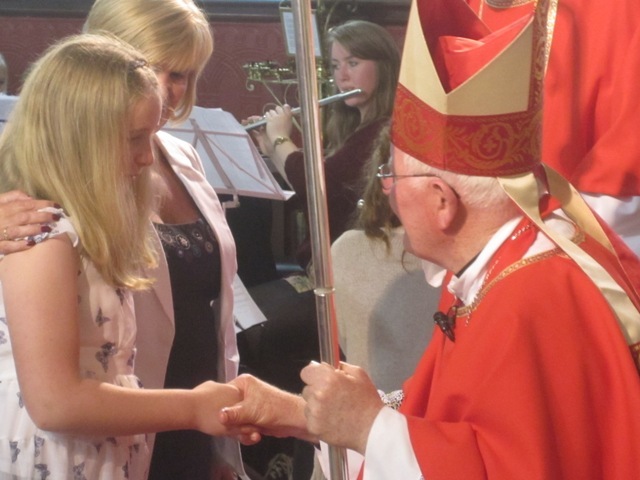 Each Confirmation Mass has its own special atmosphere and, as I have often noted on this Blog, the smiles on the faces of the newly-Confirmed and the obvious pleasure of parents and family expressed in the reception which follows, indicate that something more is at work on such occasions. I have no doubt that this is indeed the presence of the Holy Spirit.